Rome wasn’t built in a day….but you can see most of its iconic monuments in one with this action-packed, 6-hour Segway tour! Spend a morning zipping around the southern half of Rome, home to magnificent ancient landmarks like the Colosseum and Roman Forum. Break for a delicious lunch at a local restaurant, and continue on in the afternoon to experience Rome’s most beautiful Baroque and Renaissance highlights. It’s a fantastic way to make the most of your time in the Eternal City. 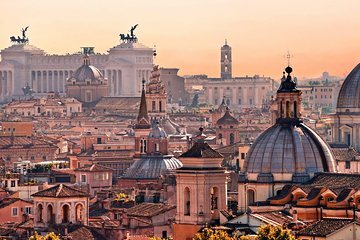 With this tour, see Rome from Pincio Hill and ride around the gardens at the foot of Castel Sant’ Angelo. Ellie with Rolling Rome was amazing and will definitely ask for her again. She took us in hand, made sure we could handle the Segways safely and off we went. I'm a 59 yr old woman with bad legs but I did great on the full day tour and saw 5x as much than if I had tried to see it on foot - I just would have missed a ton! Ellie knows her history but makes it fun and interesting, she's careful with her charges around the crowds, and took good care of us. I can't say enough and I'm sold on the concept of Segway tours. Top activity for some of our group. Dimitri was a great tour guide. This was great as a first activity when arriving in Rome, to get the lay of the land in a very efficient way. Seeing so much via Segway sure beat walking!! The 6-hour tour was long, but we had good breaks to walk around and rest our legs.